It was such a great tour seeing those two beautiful cities and then the lunch and wine tasting on the most amazing vineyard. What made it so great was our tour guide Greta Ricci and our bus driver Stefano. Greta’s knowledge of the history of this country was so impressive and we learned so much from her. She was so informative and very kind! Stefano was so much fun! Our tour guide Alice and driver Luigi for our small group of only 2 couples were very personable, and informative. The views of the Tuscan countryside were wonderful, and the drive each way was about a hour. Both Sienna and Sam Gimignano were amazing to see. Lunch and wine tasting at the beautiful vineyard home was lovely. A truly memorable experience! Also,we later enjoyed both Florence restaurants that Alice and Luigi recommended. We had a great time! Loved our guide. Had a great lunch. Just enough time to visit the towns and experience the history of the areas and see the sights. 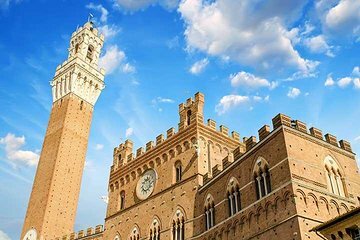 The perfect day trip into Tuscany from Florence. It was a great trip especially having a small group. The guide in Siena was very knowledgeable. There is a good balance of group touring and free time. The lunch at the winery was so much fun! Well worth the cost. We plan on doing it again with with group of our friends next year. Alice and Francesco were great tour guides. Alice knew the history of each location, each of the places we visited, and her English was very good. Francisco was an excellent driver, and the two make a great team. There were two other couples on the tour, so it was small and just perfect. I highly recommend Alice and Francesco! I booked a small group tour and thought my husband and I would spend the day with about a dozen other people. To our surprise only one other had person joined us. Our guide met us with a luxury car instead of a mini van. Alessandro Martini was professional, asked about our interests, and did the most to ensure we learned about Tuscany. Both Siena and San Gimingnano were lovely and we had enough time in each. The wine tasting was good too, even if the lunch was a little light. I recommend this tour, especially because of our guide. Both driver and guide were excellent - knowledgeable, entertaining and accommodating. They arrived on time and the excursion ended on time. Great tour with a personable and knowledgeable guide. Lunch was great. Highly recommended. We loved our tour guide, Alice! She did a great job leading this tour. It was a very comfortable small bus with only our family of 5 and 3 other travellers. Alice led us on a very interesting walking tour of Siena and we also had a little free time to explore Siena before making our way to San GImignano. We then stopped at a beautiful vineyard just outside of San Gimignano. What a delicious tasting and lunch we had there! We ordered some wine to be shipped directly to our home. Then we traveled a very short distance to the ancient town of San Gimignano which had towers and winding streets with little shops along the way. We enjoyed some delicious Gelato here. We had free time to explore the beautiful town before heading back to Florence.